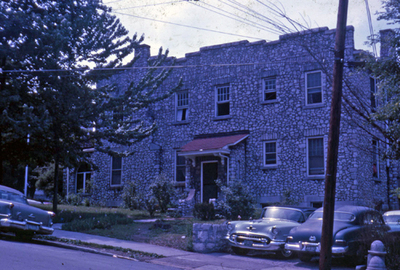 The Rock House was purchased for $28,000 from S.T. Rabold. Little is known about the origins of the Rock House. It begins to appear on Sanborn insurance maps in the mid-1930's. The building was purchased by the university in the fall of 1946 at a cost of $28,000. It was refurbished and used as a men's dormitory. By 1949 WKU women had found a home in the Rock House. Later the building was used to house international students. They were moved out in 1996 when the Rock House was turned over to the Anthropology department.